In this most recent body of work, Karen Roehl, a celebrated Colorado artist, explores the process of creating deconstructed landscape paintings, and the quality of trust this practice requires. 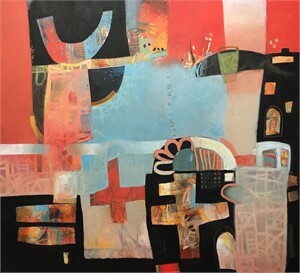 In describing this most recent show, Roehl shares, “the shapes, lines and color you find in my work can all be parts to a representational piece, they are just not arranged in a way where we recognize the subject matter. These landscapes are deconstructed and the parts tossed randomly onto a surface…a little chaotic, but parts of a whole that have a relationship with each other. Or parts of a past whole that are awkwardly pieced together... “cobbled”. The careful process of creating Roehl’s paintings, involves building many layers of marks. This requires the artist to let go, and start anew, until the combination of various revealed and hidden parts of the layers comes together to create the final complete work of art. 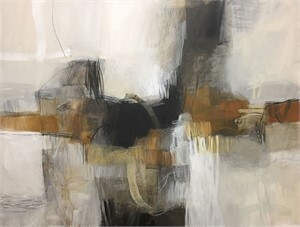 Inspired by the iconic Abstract Expressionist movement, Roehl’s work as a whole, aspires to visually access the inner workings of a self on an individual scale, and as a human, on larger scale of local and global community. 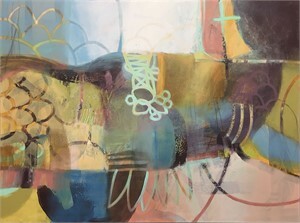 Karen Roehl has earned a Bachelor of Fine Arts degree from the University of Colorado at Denver in 2004 and completed her BFA degree in December 2007. Roehl’s work is featured in numerous private and national collections and has also been shown at art fairs in New York and Las Vegas. 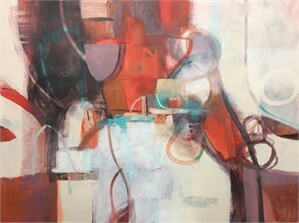 She has participated in a number of prestigious invitational exhibitions, including Coors Western Art Exhibit, Denver, CO and Stampede Western Invitational Art Exhibit. Roehl joined the faculty at Art Student’s League of Denver in 2011 and has been teaching there since. In the Project Space: Karen Roehl— Cobbled Landscapes In this most recent body of work, Karen Roehl, a celebrated Colorado artist, explores the process of creating deconstructed landscape paintings, and the quality of trust this practice requires. 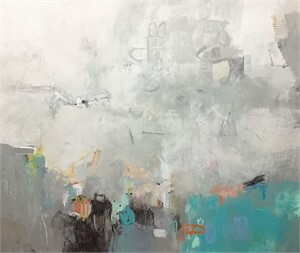 In describing this most recent show, Roehl shares, “the shapes, lines and color you find in my work can all be parts to a representational piece, they are just not arranged in a way where we recognize the subject matter. These landscapes are deconstructed and the parts tossed randomly onto a surface…a little chaotic, but parts of a whole that have a relationship with each other. Or parts of a past whole that are awkwardly pieced together... “cobbled”. The careful process of creating Roehl’s paintings, involves building many layers of marks. This requires the artist to let go, and start anew, until the combination of various revealed and hidden parts of the layers comes together to create the final complete work of art. “The trust comes in when I decide to cover up a part of the painting that I’m attached to in order to get to something bigger. I trust that the thing, which I created and feel is beautiful, is not a one-shot deal. In other words, I trust that it is within my power to create beauty again and again, in its infinite manifestations.” Inspired by the iconic Abstract Expressionist movement, Roehl’s work as a whole, aspires to visually access the inner workings of a self on an individual scale, and as a human, on larger scale of local and global community. 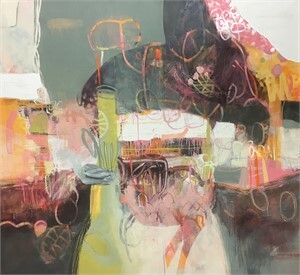 Karen Roehl has earned a Bachelor of Fine Arts degree from the University of Colorado at Denver in 2004 and completed her BFA degree in December 2007. Roehl’s work is featured in numerous private and national collections and has also been shown at art fairs in New York and Las Vegas. 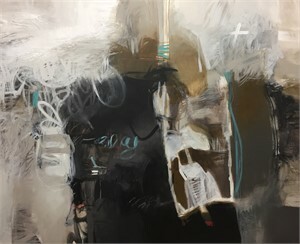 She has participated in a number of prestigious invitational exhibitions, including Coors Western Art Exhibit, Denver, CO and Stampede Western Invitational Art Exhibit. Roehl joined the faculty at Art Student’s League of Denver in 2011 and has been teaching there since.